City Parks and Recreation, my.spokanecity.org. Fun Unlimited, (208) 620-9050; cdasports.com. ROW Adventure Center, (208) 770-2517; rowadventurecenter.com. Silver Bow Fly Shop, (509) 924-9998; silverbowflyshop.com. Spokane River Water Trail; spokaneriver.net/watertrail. Visit Spokane, (509) 624-1341; visitspokane.com. 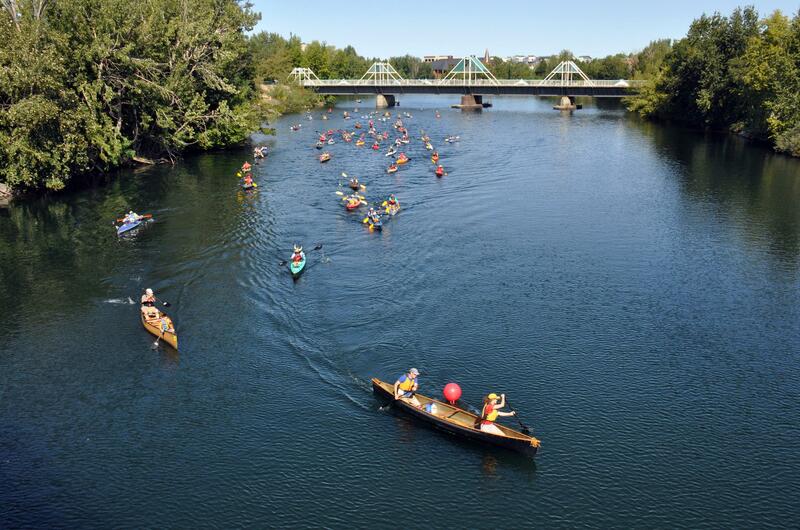 The Spokane River provides a steady flow of distinction to downtown Spokane, and a healthy splash of fun. Few cities can claim a natural asset that puts the business district in touch with fishing, biking and paddling as well as hiking within face-washing distance of a thundering waterfall. ROW Adventures has a downtown office with a shuttle bus that delivers guests within minutes to the T.J. Meenach Bridge and the start of a rapid-splashing rafting trip. ROW takes advantage of whitewater rapids below downtown and flatwater upstream including paddling trips that conclude with craft beer tasting at No-Li Brewery. While native redband trout lure anglers to fly fishing in Spokane Valley and downstream from the falls, Avista stocks about 6,000 catchable-size rainbow trout in late June to provide an urban fishery from Riverfront Park upstream to Upriver Dam. Downtown anglers have been known to fulfill their wildest dreams. Joe Buster, a Spokane teenager at the time, was fishing for trout in the flatwater pool across from the Carousel on Aug. 13, 2011, when he hooked a 42 inch-long northern pike that apparently had drifted downstream from Idaho. Buster landed the whopper with the help of cheering lookers. A friend transported the fish on his bicycle three miles to Buster’s home. A river is valuable to any city, but a river that invites recreation takes on ambassador status. On June 12, half of the Visit Spokane staff donned lifejackets and launched with an outfitter to raft a stretch of Spokane’s namesake stream. “We talk about the river a lot to our customers so we want our employees to experience it and know what they’re talking about,” said Cheryl Kilday, Visit Spokane president. She said Visit Spokane research indicates the river and waterfalls are the No. 1 attraction to travelers visiting the city. Riverfront Park is a recreation center in itself. Runners can plan leisurely-to-vigorous lunchtime workouts on paved paths with the river as a constant companion, and without the hassle of crossing a road. Fun Unlimited will add sit-on-top kayaks to its rental fleet of stand-up paddleboards available this summer from a concession tucked away under the Division Street Bridge. Based on the Spokane River at Post Falls, the company opened the second location in downtown Spokane last year, renting boards to paddlers and leading SUP yoga classes on the water. Owner Cara Quien said this year’s prolonged spring runoff has delayed Fun Unlimited season, but operations are poised to open any day. The recently expanded Convention Center maintained access to the river for paddlers to play in the waters upstream from Division Street Bridge. “We tell customers to park in the Convention Center parking area, walk through the breeze way, hit the Centennial Trail, turn right and there we are,” Quien said. City ordinance prohibits swimmers or craft in the river downstream from Division Street because of the falls and power generating structures. However, floatable water resumes below Maple Street where a new boat access at Glover Field is planned pending funding from the Washington Legislature. Fun Unlimited’s business last year was more than 50 percent locals checking out a new way to enjoy the river, Quien said. She’s working with downtown businesses to increase the visitor segment this season. Building recreation into major construction projects has caught on downtown. Kendall Yards developers embraced the Centennial Trail and literally paved the way for a Monroe Street underpass and expanded biking, hiking, running, paddling and fishing recreation in the river gorge. Trail work is planned on the south side of the river to connect a 3.5-mile gorge walking-biking loop from Kendall Yards on the Centennial Trail to Sandifur Bridge and back upstream through Peaceful Valley to Monroe Street Bridge. There’s no need to wait for the project’s completion. The basic route has been hiked for years by people using Riverside Avenue sidewalks on the south side of the river. Avista redeveloped the 3.8-acre Huntington Park into an inviting place to walk, sit, snack or burn calories running the steps along the falls. The city’s $320 million project to install a 2.2 million-gallon stormwater tank east of Monroe Street and south of the falls includes plans for more recreational pedestrian connectivity. The river is good for downtown because it encourages people to linger, say advocates including Andy Dunau, executive director of the Spokane River Forum. “We’ve come a long way since the industrial age when the community turned its back on the river and faced its buildings away from the river and told their kids not to swim in the river,” he said. Dunau, who’s running for Spokane City Council, says his nonprofit has promoted the river as a resource and brings agencies and the public together to find win-win solutions to river issues. “Recreation is a huge part of that,” he said. He helped develop the Spokane River Water Trail in 2013 with a website that allows users to find river access points, services and other information. “Since we started the trail, nine new or restored access sites have been added to the river,” he said. Water is more than part of the experience of being downtown, he said. Published: June 25, 2017, midnight Updated: July 8, 2017, 2:15 p.m.